On 20 October 1944 a composite air force, made up of P-47 Thunderbolts from 261 and 146 Squadrons, carried out a low level attack on the vital Japanese stronghold at Mingaladon Aerodrome near Rangoon. 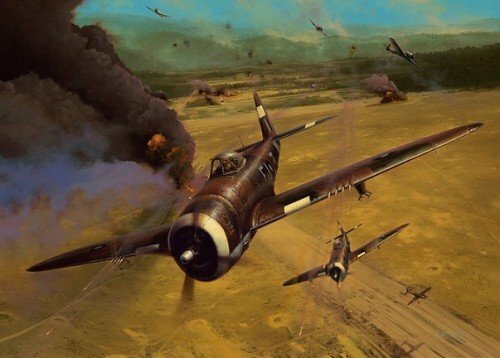 After completing his bombing attack Warrant Officer Thomas ‘Lucky’ Carter flying his distinctive P-47 'Pistol Packin’ Mamma', engages Nakajima Ki-43 Oscars and Ki-44 Tojo's along with other Thunderbolts of the unit. In commemoration of the men who flew and fought in Burma, the Military Gallery is honoured that joining artist Richard Taylor in signing the whole edition are three RAF veterans that fought in the campaign, two that flew Thunderbolts in Burma and one of the vital ground crew that prepared the P-47’s for this actual mission. A fitting tribute to all those that fought in the ‘Forgotten War’.